For a lucky few, light conversation at parties and social events is a breeze. For the rest of us, there is Carol Fleming (bestselling author of It's the Way You Say It), who breaks even the shortest bit of small talk into an understandable process that anyone can master. 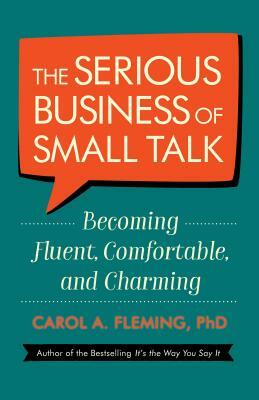 Carol Fleming wants to show you that small talk is not as "small" as you might think. It's the foundation of every relationship, professional and personal. It is the sound of people reaching out to each other, searching for similarities, shared interests, goodwill, connections, and friendship. And it's something we all do every day with people we know. It's just the one little bit about strangers that throws some people off. Graceful social conversation can be learned, even by those requiring the smallest of baby steps. Fleming covers the inner and outer aspects--from the right attitude to how to dress, move around, and introduce yourself. Most importantly, she lays out a series of simple, memorable conversational strategies that make it easy to go from "Nice weather we're having" to a genuine, rewarding give-and-take. But she won't tell you what to say. Believe it or not, you already have what you need inside you. She merely provides the keys to unlock it. Small talk is the language of welcome, the extension of friendliness, the gracious acknowledgment of others, the kindly exchange of introductions and smiles, and the creation of a safe, courteous social space--and this is what has you terrified? After you read this book, you'll wonder what all the fuss was about. Carol A. Fleming, PhD, is a personal communication coach specializing in vocal development and bringing her unique knowledge and skills to the speaking needs of individual and corporate clients. She is the author of the bestselling It's the Way You Say It and is currently the chair of the Member-Led Forums for the Commonwealth Club.